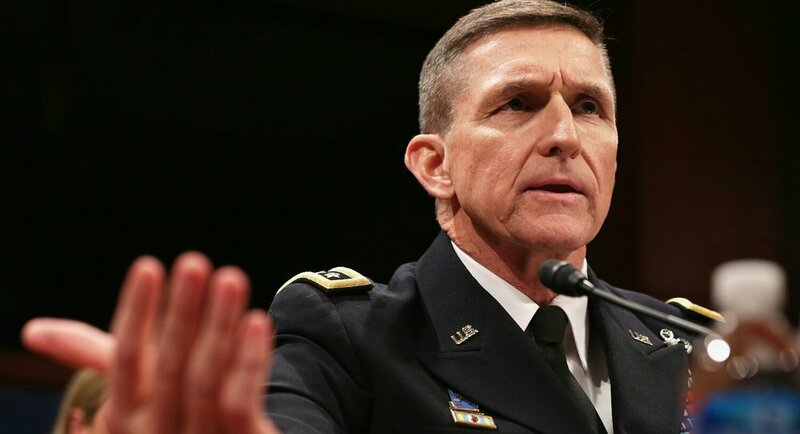 WASHINGTON — Michael T. Flynn, the national security adviser, resigned on Monday night after it was revealed that he had misled Vice President Mike Pence and other top White House officials about his conversations with the Russian ambassador to the United States, according to a source close to the Trump administration. Mr. Flynn, who served in the job for less than a month, stepped down following days of reports that he had spoken to the ambassador about American sanctions against Russia in late December, weeks before Mr. Trump’s inauguration. Mr. Flynn previously had denied that he had any substantive conversations with Ambassador Sergey I. Kislyak, and Mr. Pence repeated that claim in television interviews as recently as earlier this month. But on Monday, a former administration official said the Justice Department last month warned the White House that Mr. Flynn had not been fully forthright about his conversations with the ambassador. As a result, the Justice Department feared the Mr. Flynn could be vulnerable to blackmail by Moscow. Officials said Mr. Pence has told others in the White House that he believes Mr. Flynn lied to him by saying he had not discussed the topic of sanctions on a call with the Russian ambassador in late December. Even the mere discussion of policy — and the apparent attempt to assuage the concerns of an American adversary before Mr. Trump took office — represents a remarkable breach of protocol. The Justice Department’s warning to the White House was first reported on Monday night by The Washington Post. The White House has examined a transcript of a wiretapped conversation that Mr. Flynn had with Sergey I. Kislyak, the Russian ambassador, in December, according to administration officials. Mr. Flynn originally told Mr. Pence and others that the call was limited to small talk and holiday pleasantries. Mr. Trump, however, has become increasingly concerned about the continued fallout over Mr. Flynn’s behavior, according to people familiar with his thinking, and has told aides that the media storm around Mr. Flynn will damage the president’s image on national security issues. White House officials have begun discussing the possibility of replacements, and Mr. Trump is consulting Jim Mattis, the secretary of defense and a retired four-star general. Among the options are David H. Petraeus, the former C.I.A. director, and Thomas P. Bossert, the head of Mr. Trump’s domestic security council. Mr. Petraeus, also a retired four-star general, was forced out as the director of the C.I.A. because of an affair with his biographer, to whom he passed classified information. Mr. Petraeus would not need confirmation by the Senate as national security adviser. Tatiana is an award-winning journalist living in Los Angeles. She started her career in Atlanta in 2001, covering Latino issues and immigration as a freelance writer and then for a bilingual weekly. She spent the next few years as a section editor for Atlanta Business Chronicle, managing a team of freelance writers and working with designers to create relevant and enticing content. After moving back home to Southern California, Tatiana covered the city of Victorville for the Daily Press and pioneered their nightly web cast. During the early years of the Obama administration, she wrote for China Daily USA as their freelance correspondent for Southern California. While the journalism industry was defragging, Prophet spent four years as a singer-songwriter in Los Angeles, playing the Viper Room Acoustic Lounge as well as the House of Blues Voodoo Lounge, plus regular appearances at TRiP Santa Monica. In 2016, Prophet started Back to Facts, realizing that fake news of all kinds would prove a formidable enemy in the years to come.